Yasuko and Kyoko's father. 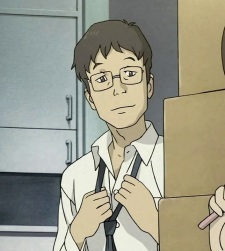 He works at the Cyberspace Administration of Daikoku, and is Harakawa Tamako's superior. He is also responsible for coming up with the nickname and catchphrase of the Searchmaton ("boku Satchi"). To his embarrassment, he is also the 1st member of the Coil Denno Investigation Agency, as he was volunteered (or "blackmailed") by his mother to join.